I'm going to Italy today! 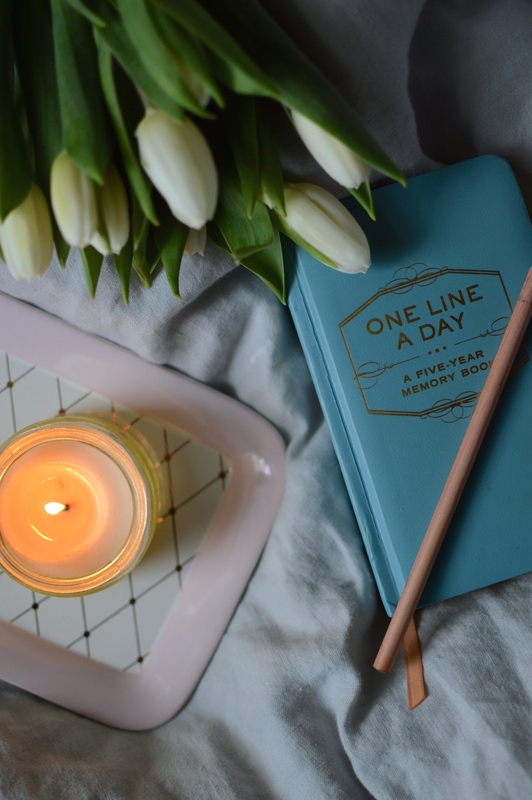 I was going to line up a few posts for while I'm away, but I decided to host a little giveaway instead to win one of these One Line A Day journals. Scroll down for details on how to enter. I've been keeping my One Line A Day journal for a couple of years now. I don't always manage to fill it in every day, but it's nice to look back on the things that made me smile on that day last year and even the year before that. Spring always has me feeling super positive, so I thought I would create a Gratitude List for my blog to keep that positivity going. If you'd like to take part, leave a comment with something that is making you happy right now; it could be something big like moving house or something small - perfectly ripe avocado, anyone? - or it could be something you're looking forward to, like a holiday, graduation, etc. The obvious theme is that it has to be positive! On Friday 24th April (my birthday!) I'll choose one person at random to win their own One Line A Day memory book. If you want to increase your chances of winning, follow me on Twitter (@catherinesprunt) or Bloglovin' for extra entries and make sure you let me know in the comments so I can count you in. I'll pick the winner at random next week. Good luck! I'll start: right now I'm grateful for living in Europe, so we can hop on a plane at lunchtime and be on the Italian coast in time for dinner. Have an amazing time in Italy! I took some extra time to make porridge with a blueberry and cinnamon topping this morning, and ate it sitting at the table with a coffee and a magazine. That's making me pretty happy right now. Oh Italy, bring me all the cheesey pasta and gelato. Hope you have a wonderful time! This week I'm thankful that no one was hurt the fire that affected my office two weeks ago. I was very thankful that I could work from home in the meantime - but at this point am so glad to be back at my desk! Have an amazing holiday! I love these books. I'm on my fourth year of my sentence a day book and I love having a book stuffed full of memories. I would love a new one for when I'm done with this next year! I am grateful for my wonderful flatmates at the moment who provide endless fun and new friends in Melbourne! I am grateful for having the best parents in the whole world ! I'm glad to have found your blog - I already follow you on twitter (@frauleinlouise) but somehow didn't realise you have a blog! Just followed you on Bloglovin' too.